Our company has a comprehensive professional development plan as well as a well mapped out career advancement plan. We have also carved out a good learning environment at the workplace. By going through on job training by means of job rotation and career advancement, we allow every employee to make progress based on their career development plans at a suitable pace according to their individual ability and experience. Every employee will be well equipped with the necessary technical knowledge as well as good management skills. In order to provide multiple and independent learning avenues for employees, Formosa Plastics Group has set up an e-Learning portal since year 2000. Presently, we have 457 online learning courses in the portal. Other than online courses, we have reading articles, books, webcast and many other learning aids in the portal to help our employees. To allow our employees to receive the latest information on learning, monthly E-Newsletter are also sent to our employees. On top of it, we also have our knowledge based expert system which stored various knowledge based articles and information on the operational aspects of the company since year 2000. This is to facilitate easy referencing and sharing among our employees as well as to store for future usage. 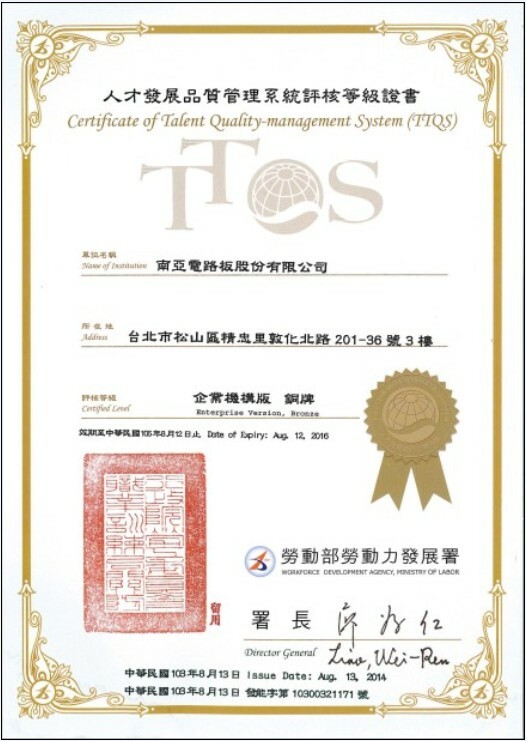 We are certificated by Bureau of Employment and Vocational Training for Taiwan TrainQuali System (TTQS) of 2011.